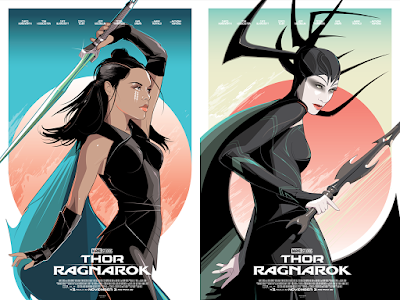 To commemorate Marvel’s release of Thor: Ragnarok in theaters this weekend, Hero Complex Gallery and Fandango put on an insane Thor: Ragnarok art show featuring a killer line-up of artists! Two of my favorite pieces from that show are these gorgeous Hela and Valkyrie movie poster screen prints by Craig Drake. I don’t know if they’re sold out or if they’ll ever be made available online, but The Blot wants both. I could seriously stare at Craig’s retro style take on Marvel, Disney and DC Comics characters all day long.